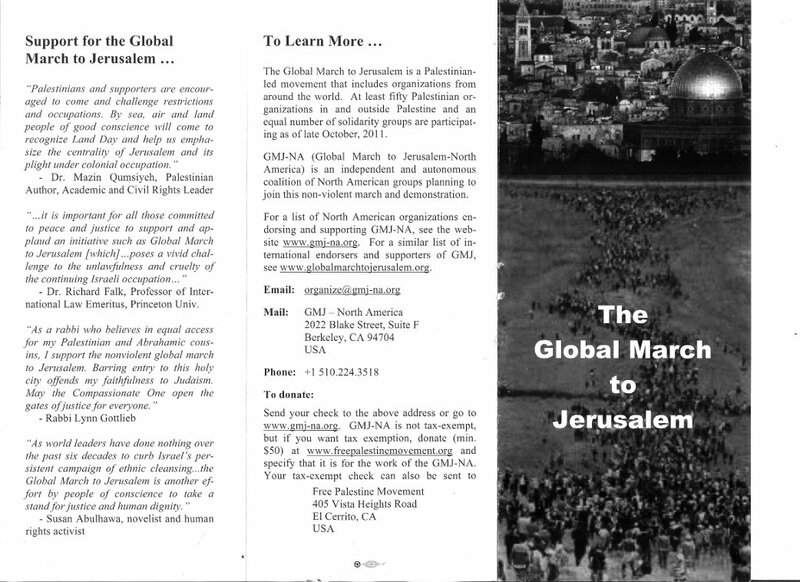 In an interview with the Palestinian news agency Ma’an on March 19th, Global March to Jerusalem (GMJ) spokesman Zaher Birawi stated that the organizers are “not interested in confrontation with the Israeli army, after similar demonstrations a year earlier ended in bloodshed”. Whilst it is difficult to imagine exactly what sort of effective controls the GMJ organizers have been able to put in place in order to prevent their aspired one million man march from descending into violence, it should also be taken into account that a considerable number of the GMJ organizers are veterans of the flotilla project who still describe the Turkish activists aboard the IHH-sponsored Mavi Marmara in 2010 as ‘humanitarian aid workers’. Others are members of various ‘popular resistance committees’ which define the weekly riots at places such as Bil’in and Nebi Salah as ‘non-violent protest’. The heavy involvement of Hamas and the Iranian regime in the march’s organization, together with support from Hizbollah and the Palestinian Islamic Jihad also raises doubts as to the sincerity of the professed commitment to non-violence. 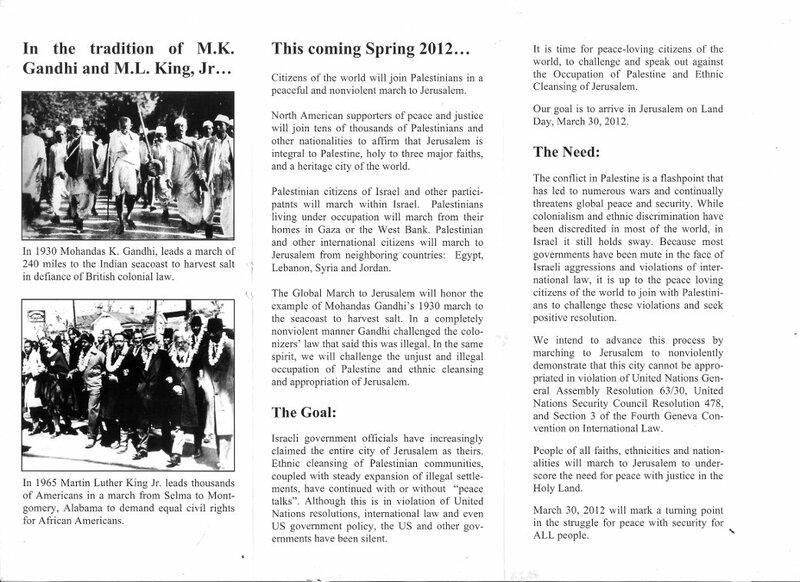 Coincidentally, the North American chapter of the GMJ has put out a new leaflet replete with messages of non-violence and invoking Mohandas Gandhi and Martin Luther King as role models. When compared to the original publicity put out by the GMJ organisers, it is rather obvious that someone appears to have reached the conclusion that the North American audience is in need of a somewhat softer approach. However, over in South East Asia, audiences are apparently deemed by local GMJ organizers as being susceptible to somewhat different messages in the attempt to raise support for the project. As can be seen in the video of the event below, their idea of “scenes of the march toward Jerusalem” apparently includes dead Israeli soldiers. Somebody obviously missed out on the ‘non-violence’ memo.